The “Blue Dog Coalition” just announced its new members and leadership for the 116th Congress starting in January 2019. The only Virginian in the group – which declares that its goals are “commonsense, bipartisan solutions that will get our country’s fiscal house in order and ensure a strong national defense” – is Congresswoman-elect Abigail Spanberger (VA-07). Now personally, I’m not a big fan of the “Blue Dog Coalition.” That’s NOT because I’m a progressive, nor because I’m against having a “big tent” Democratic Party, nor because I have anything against “commonsense,” “bipartisan solutions,” “a strong national defense,” or “get[ting] our country’s fiscal house in order.” Those are all perfectly fine things, IMHO. So what’s my problem with the “Blue Dog Coalition?” Mostly, I find the entire concept that the solution to what ails us as Democrats isn’t winning more elections, but reaching out more to those poor, downtrodden Republicans. That’s, frankly, just laughable. For starters, Democrats have consistently bent over backwards to reach “across the aisle,” and it hasn’t worked…at least not in recent years. Take President Obama, for instance, who time after time after time after time after…(you get the idea) reached out his hand to Republicans, only to have it slapped away by Mitch McConnell, Eric Cantor, etc. For instance, the Affordable Care Act (ACA) was largely modeled after conservative approaches (e.g., Romneycare, the 1993/94 Republican alternative to “Hillarycare,” the “exchanges” and “individual mandate”), yet the ACA got essentially Z-E-R-O Republican support. Or take the American Recovery and Reinvestment Act of 2009 (the “stimulus”), which was smaller than it would have been, had more in tax cuts as opposed to investments, etc., etc., yet received not a single Republican vote in the House and only three Republican votes in the Senate. Or take President Obama’s attempt to reach a “grand bargain” on the budget deficit with John Boehner, Eric Cantor et al. Again, Obama reached wayyyy across the aisle, too far in the view of many progressives, yet yet AGAIN had his hand slapped away, with the idiocy of “sequestration” imposed on the country by Republicans. Oh, and of course Senate Republican Leader Mitch McConnell famously declared his #1 goal was for President Obama to fail. In sum, the history of Democrats “reaching across the aisle” in recent years has not been pretty. Or successful. Or even pretty successful. More to the point, the supposed lack of Democrats reaching across the aisle has most certainly NOT been the problem, nor has excessive “partisanship” (whatever that means) on the Democratic side. Yet “Blue Dogs” won’t give up those stale, tired, meaningless, mindless old talking points. So yeah, I have a problem with that. That brings us to the final big problem I have with the “Blue Dog Coalition,” which is that it simply hasn’t worked, politically speaking, for its members. For instance, in 2010, “Blue Dog” Democrats were wiped out, including Glenn Nye in VA-02, who lost despite (or maybe BECAUSE of?) having bent over backwards to oppose excellent, important legislation like the Affordable Care Act and the American Clean Energy and Security Act. 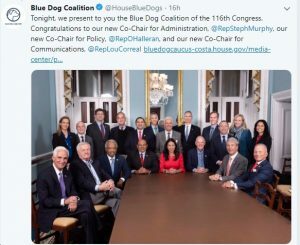 Overall, the “Blue Dogs” have gone from 54 members in 2009-2010 to just 24 members now, with no sign that being a member of the “Blue Dog Coalition” is at all helpful – and possibly even harmful – politically speaking.